In the midst of ministry and life, we DCEs need to be reminded of the sure hope of Jesus that is our anchor. Join us in San Diego, January 2nd-4th, 2019, as we come together in the confidence of our Savior, our solid anchor, to embrace the hope as we live out our calling. We desire DCEs, like you, from all walks of life and ministry to know that this conference will speak to you in whatever season you are in. 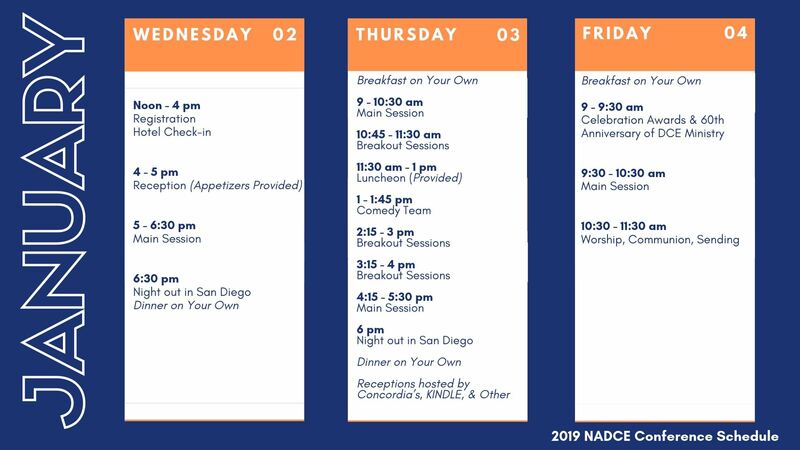 What is the NADCE Conference? The bi-annual gathering of Directors of Christian Education is our professional conference to support and lift up the ministry of Christian Education in our Lutheran Church. We will unite through our unique ministry as Directors of Christian Education. This will be a time to worship, rest, listen, connect and recreate. DCE’s in all seasons of ministry and life will learn something new, network and be affirmed in their calling. What exhibitors will be at the NADCE Conference? When will the 2019 NADCE Conference take place? Registration will be open January 2nd, Noon-4:00pm. The conference will begin onJanuary 2nd at 4:00pm and conclude on January 4th at 11:30am. Where is the 2019 NADCE Conference located? The Town and Country Hotel in San Diego, California. Where will I check in upon arrival to the hotel? Enter at the Fashion Valley Road entrance. You may either drive up to the curb in front of the lobby or park in the lot off of Fashion Valley Road. When you arrive to the hotel, check in and exhibitors will be in the foyer entrance to the Golden Pacific Ballroom. View the Town & Country hotel map to orient yourself with the property. Who is the 2019 NADCE Conference for? We desire for any and every DCE to know that this conference is a place and a time for them to revel in who we are as DCE’s. It will remind them why they got into DCE ministry. In gathering with other DCEs, participants of the conference will know that they are valued and supported. We will come together in the confidence of our Savior, our solid anchor, to embrace the hope as we live out our calling. And DCEs will learn, worship, network and be stretched and challenged to bring their best to their ministry, their call and to God’s Church. Can I attend if I am not a member of NADCE or a Director of Christian Education? How can I register for the 2019 NADCE Conference? Online on NADCE’s website, register before December 15th! Your registration fee includes an afternoon reception with heavy appetizers on January 2nd and a luncheon on January 3rd. There are three food options on property at the Town and Country, and The Terrace Cafe, The Market and Trixies. Restaurants and a food court are available within a 10-15 minute walk to the Fashion Valley Mall and surrounding area. Also included in the registration price is a Trolley Pass for your time during the conference. Evenings are free so that you may utilize the trolley with your pass to go to Old Town, Little Italy, Seaport Village area, or the Gaslamp District for connecting with friends, eating and seeing the sites. Arrive with plenty of time to check in and settle in. Registration will be open January 2nd, Noon-4:00pm. The conference will begin onJanuary 2nd at 4:00pm and conclude on January 4th at 11:30am. Dress for Southern California January weather. We recommend you pack casual attire and plan to wear layers. When will the DCE awards take place? We will celebrate and recognize DCE awards on Friday, January 4th at 9am.